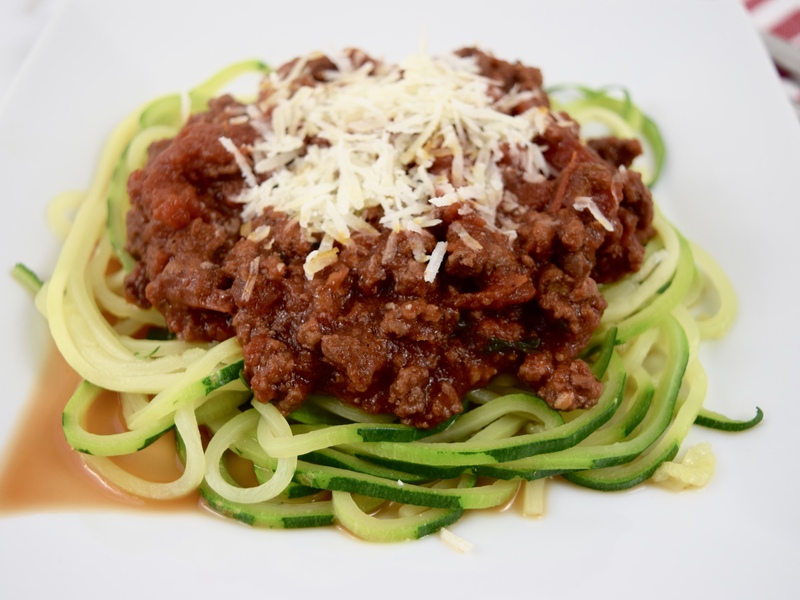 Since I have to follow a special diet for my medical procedure on Friday, I thought I would make beef bolognese with zucchini pasta for tonight’s dinner. I can eat vegetables, as long as they are cooked. Normally, I would have whole wheat pasta, but no whole grains this week! 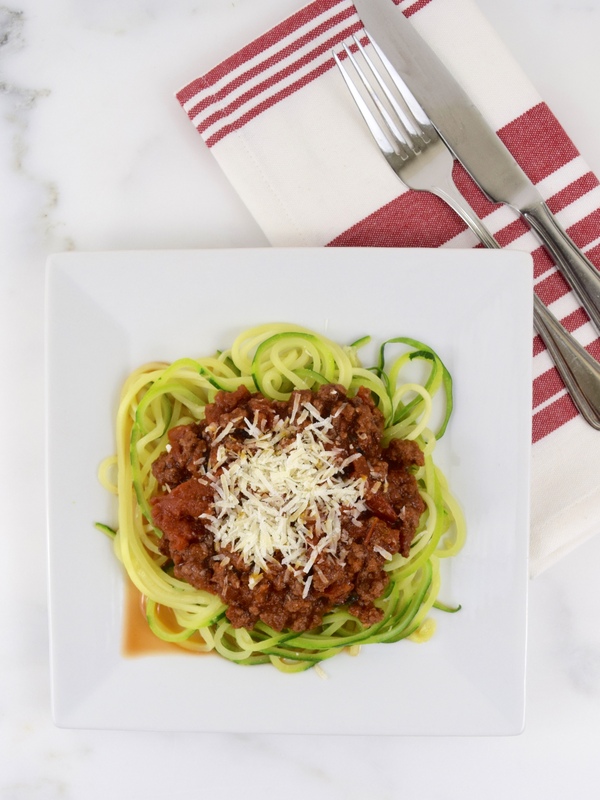 The inspiration for my dish came from Ina Garten’s “Weeknight Bolognese,” Food Network, 2015. As usual, I made changes to the recipe, reducing the amount of wine and salt and eliminating the cream. The sauce with its hint of spiciness from the red pepper flakes compliments the mild tasting steamed zucchini! I had purchased the Paderno 4-Blade Spiralizer at Williams-Sonoma earlier in the summer, but it remained in the box until today. Like with so many kitchen gadgets, there was a learning curve. After I figured out how to put it together, I used a blade which made angel hair sized pasta. I thought it was too “dainty” for the bolognese, so I tried the next size larger. It was the perfect thickness for the sauce and for steaming! Heat a 12-inch nonstick frying pan on medium-high heat. 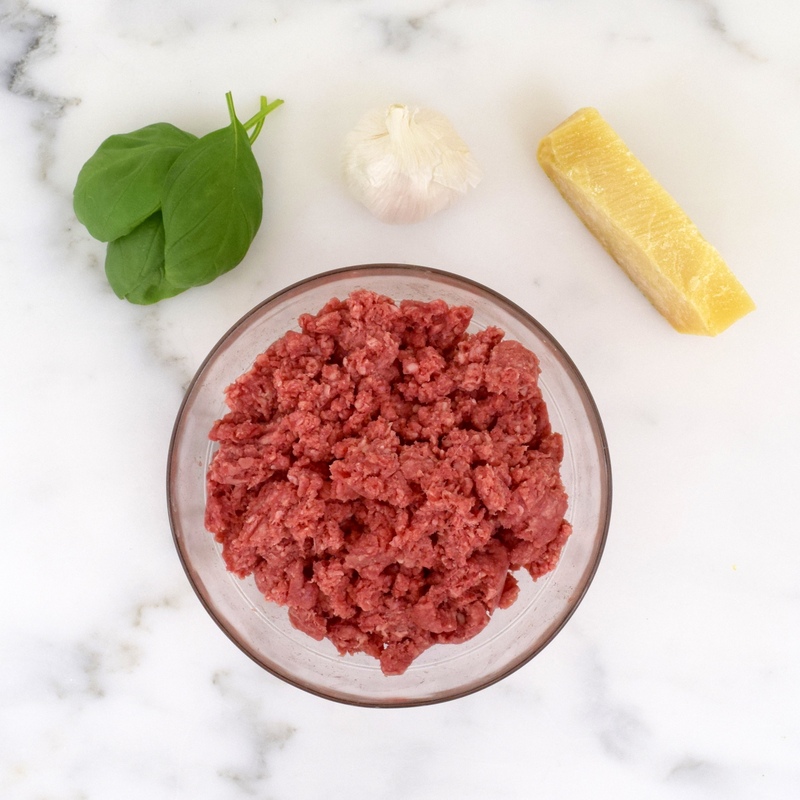 Add ground beef, breaking it up with a wooden spoon into small pieces, until no longer pink and slightly brown. Depending on the leanness of the meat, drain any excess fat. Return to the heat, add garlic, oregano and red pepper flakes. Cook for 1 minute. Pour the wine slowly into pan. Add tomatoes and tomato paste. Season with salt and pepper. Stir ingredients, until well combined. Bring to a boil, then simmer for 10 minutes. While the sauce is simmering, steam the zucchini, until slightly tender. Finally, add nutmeg and basil and stir well. 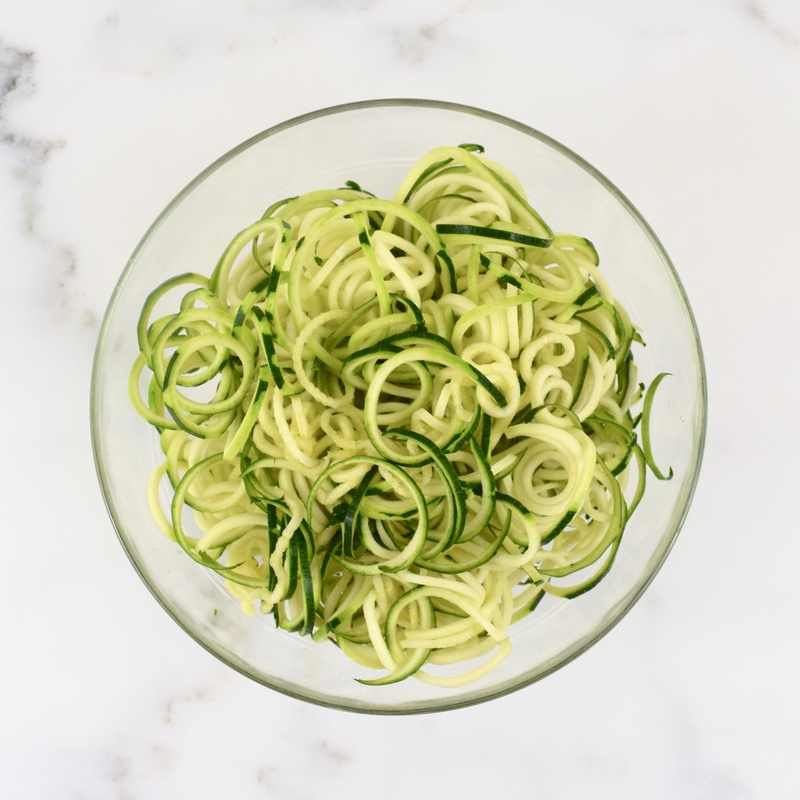 Serve on top of the zucchini pasta and sprinkle with Parmesan cheese. 4 to 5 servings. Good luck with the colonoscopy. I’m surprised that they’ve now added a prep diet before you actually prep the night before? That has to be tough. I’m probably due for one in a couple of years. Oh well, you are enjoying these wonderful dishes. 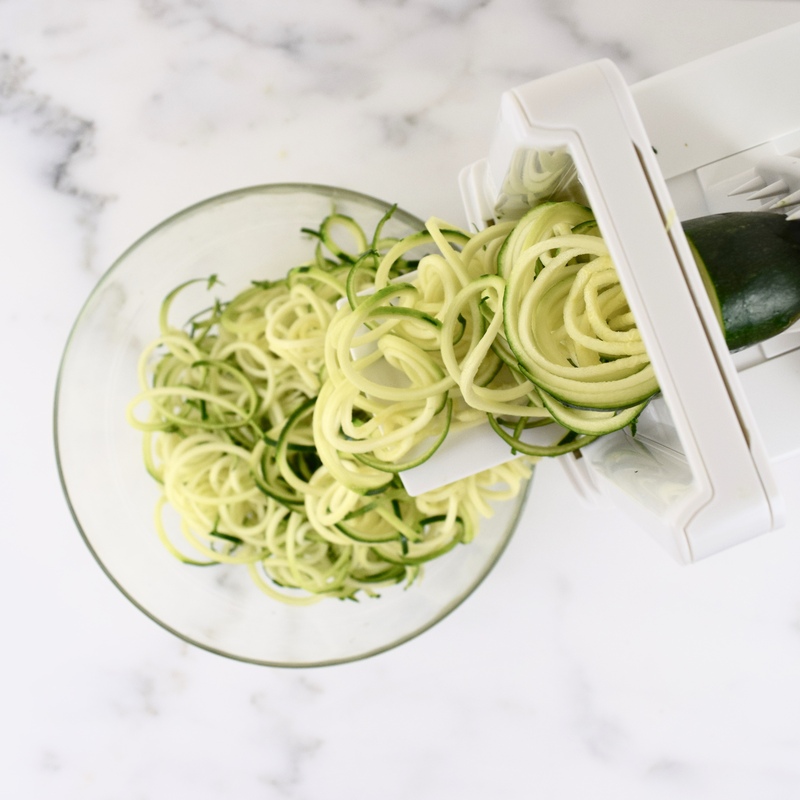 Spiralizers have become quite popular, I don’t have room in my kitchen for that gadget, but I do have something that looks like a potato peeler that does the same for zucchini pasta. 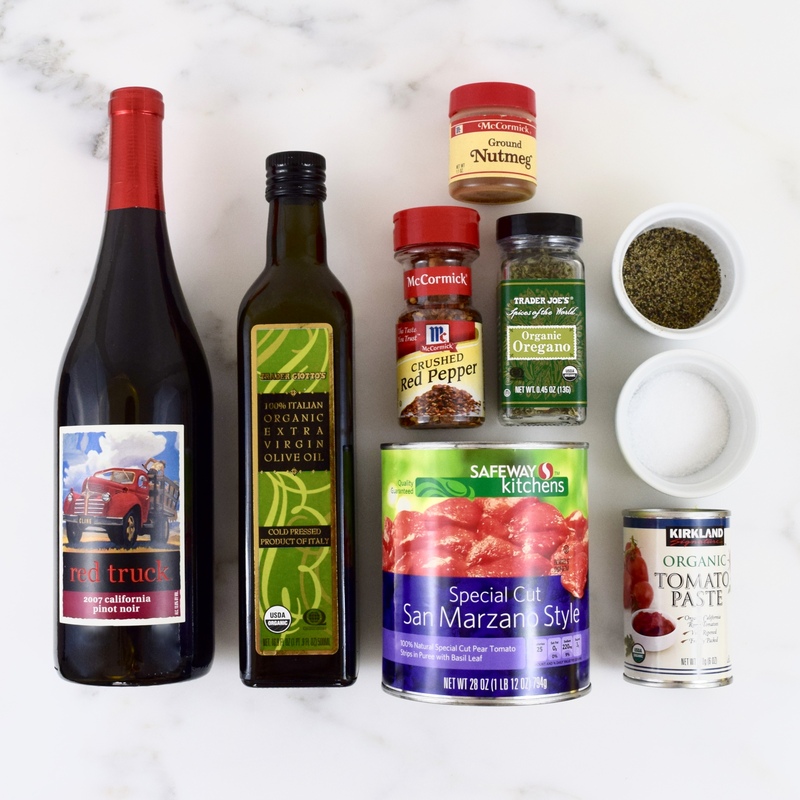 Great ingredients and wonderful recipe. Loretta, thank you for taking the time to comment. I really appreciate it! I notice you usually use store bought spices from TJs and the grocery store. Have you every tried Penzey’s spices? PS Good luck with the colonoscopy. Mardy, I do have some Penzey’s spices in my spice drawer. They are great, but I’m slowly trying to replace my spices with organic ones. Thanks so much for following my blog!